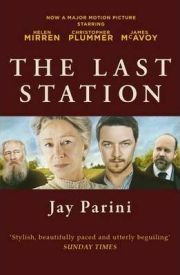 Jay Parini’s “The Last Station” is a semi-fictional account of the final year in the life of the Russian writer Leo Tolstoy. It reads very much as fiction but is actually a tapestry of voices of those closest to Tolstoy at the end of his life. At the heart of the story is the struggle for the attentions of Tolstoy between his wife, Sofya Andreyevna, and his loyal friend and promoter Vladimir Chertkov. Although Tolstoy was from a privileged family – he was actually a Count though he renounced the title – and spent his youth carousing and gambling, even losing part of the family estate Yasnaya Polyana in a bet, he later became aware of the huge inequalities in Russian society and was very critical of the Tsar and the imperial government. In 1910, his final year, Tolstoy was as much celebrated and idolised in Russia for his political philosophies and stance on poverty as he was for his literary achievements. A cadre of sycophantic supporters surrounded Tolstoy wherever he went and those around him hung on his every word; even his personal physician scribbled down his every pronouncement in a notebook hidden under the table. Only one person appeared not to share his ideals: Sofya Andreyevna. However, she did not believe that their differences made them incompatible and she faced a constant battle to prove herself in the face of criticism from her husband’s supporters. After years of trying to compete for her husband’s attentions, things came to a head when Sofya Andreyevna discovered that Chertkov had made a suggestion to Tolstoy that he should bequeath his literary works to the nation on his death. “The Last Station” charts Sofya’s desperate attempts to ensure the financial security of their children and grandchildren, and Leo Tolstoy’s efforts to die peacefully with a clear conscience. We are fortunate that the people closest to Tolstoy in his final years kept such detailed diaries. Jay Parini has taken these diary entries and used them to create a story that flows remarkably well given the frequent changes in narrator. Similar to a game of “Chinese Whispers” the story changes slightly with each different telling and readers get to see the story from every angle and make up their own minds about the characters’ motives and actions. It was fascinating to see how those people who claimed to be loyal supporters were clearly only looking to advance their own agendas while family members found their opinions and wishes pushed into the background. The image the reader gets of Tolstoy’s final hours, the weak and frail old man battling to exert his own will, while close by his friends are still plotting, was quite moving. For the main part the writing is exceptionally good and Parini has really evoked Russian literature of the period, one might think that this had been written in the nineteenth century. However, there were one or two occasions where the language did not suit the character and certainly didn’t feel right for the period. In one of her angry tirades, Sofya says “I don’t find it amusing. I find it sick” which sounded far too Hollywood to be realistic. There were also episodes that seemed irrelevant to where the story was heading; one that really sticks out is the romance between Tolstoy’s new secretary, the earnest young Bulgakov, and Masha, a young woman from St. Petersburg whose devotion to Tolstoyism has led her to Yasnaya Polyana. Tolstoy made some quite strong pronouncements against sexual relationships in his later years and Bulgakov and Masha keep their relationship secret because it goes against one of the tenets of Tolstoyism. I couldn’t really understand why the affair features so strongly in the story but it struck me that this, and the frequent hints about the relationship between Tolstoy’s daughter, Sasha, and her friend Varvara Mikhailovna, were the sort of themes that would make a film version of “The Last Station” more appealing to modern tastes. There is a strong sense, at times, that this is an adaptation of a screenplay disguised as a novel. Ultimately, though, “The Last Station” is a thoroughly entertaining read. It’s a fascinating window into Tolstoy’s final years and I’m pretty sure that if readers haven’t previously read any Tolstoy they will surely want to after reading “The Last Station”. The original sources have been beautifully plundered to create a story that seems quite fictional yet manages, mostly, to sound authentic and true to the period. I had no idea that Tolstoy’s later life was so dramatic but “The Last Station” served to entertain me and enlighten in equal measure. Published by Canongate, 384 pages. Thanks to Canongate for providing a free review copy to us. One Comment on "The Last Station"
Hi there, thanks for the review! The novel was written in 1990 – the screenplay came much later.